With its dedicated account managers and professional site reviews, EKM is an excellent choice for business owners who are serious about staying current with industry trends and fine-tuning every aspect of their Ecommerce site. On the surface, EKM looks like any other shopping cart platform. It has a user-friendly website builder, built-in content management system, and close to 200 high-quality templates. Upon closer inspection, though, EKM offers a few special features that distinguish it from the competition. Perhaps the most notable of these features is the availability of dedicated account managers. Every customer, regardless of which plan they’ve chosen, is assigned a personal account manager who not only provides technical assistance, but also offers guidance on how to optimize the store and maximize profits. Customers also receive regular site reviews—these are provided on a monthly to yearly basis depending on the user’s membership level—and they include helpful information on how to improve sales and even boost search engine rankings. The reviews are conducted by actual human beings with high-level industry experience. EKM makes it easy for online business owners to interact with their customers and maximize sales. Live chat is available for all websites, and there are a variety of conversion optimization tools like an abandoned cart saver and back-in-stock notifications. EKM’s servers offer 99.99% guaranteed uptime, so customers can enjoy a smooth, reliable shopping experience. The servers are also monitored 24 hours a day to ensure that they maintain peak performance at all times. One of the truly nice things about EKM is the fact that there’s very little risk involved. Contracts are never imposed on users, and the 28-day free trial enables customers to get a feel for the platform before spending a penny. The company even offers a 6-month money-back guarantee. So even if a user decides after 6 months that they’re dissatisfied with the platform, they can receive a refund for all the payments they’ve made. The EKM interface is a bit more complex than the average website builder, but that’s because it has a lot to offer. Although the many buttons and features may seem intimidating at first, the dashboard is pretty easy to get used to. Products are easy to upload and customize, and product information can even be imported from eBay. Bulk product uploads are also supported, and product images can be edited right from the dashboard. There’s no limit to the number of pages a user can create, and the system supports multiple staff logins for added convenience. The user-friendly interface makes it easy to create discount codes, implement a blog, and integrate social media profiles. It also offers native support with all of Google’s business tools, including Analytics, AdSense, and Search Console. For users seeking a more hands-on level of customization, EKM provides full access to the HTML and CSS coding of every template. Accepting payments is remarkably easy with EKM. The platform is compatible with nearly two dozen payment gateways, including PayPal, Sage Pay, and even Bitcoin, but a user doesn’t need to set up a third-party merchant account to get started. This essentially cuts out the “middleman” and can help save money. From the moment the store goes live, it’s automatically able to accept credit card payments courtesy of Klarna. Klarna charges no monthly fee or setup fee, but it does impose a small transaction fee for every credit card payment. The transaction fee ranges from 1.99% to 2.49% depending on the user’s membership level. That being said, EKM charges no transaction fees of its own. All of EKM’s payment gateways are PCI-compliant, and accepted payments include Visa, MasterCard, Maestro, American Express, and PayPal. In addition, the entire checkout process is streamlined to ensure the highest possible conversion rates. Customers can auto-fill information for a speedy checkout, and can instantly calculate their shipping costs by entering a ZIP or postal code. Customers can also choose from multiple delivery options and save their personal information for future purchases. Users can create custom title tags, meta descriptions, and alt image information, all of which can contribute to higher search engine rankings and a higher click-through rate. In addition, the platform automatically creates an XML sitemap for every website. This helps Google’s search spider to crawl the site more effectively and index all of the pages for search engines. That’s about all that’s included in terms of SEO, though. As of this writing, the site doesn’t appear to have an easy method for creating microformats or implementing 301 redirects. Also, it doesn’t have the kind of keyword strategy tools that are included with other platforms. Still, the account manager can provide specific SEO tips, and the site reviews include information on how to improve search engine rankings. EKM has 3 main pricing levels: Startup, Growing, and Established. All of these plans are hosted on the company’s shared servers. Any user who wants a dedicated server will need to purchase an enterprise-level Pro plan, which is priced on a POA (Price on Application) basis. Even with the shared server space, EKM is more secure than many Ecommerce platforms currently out there. For starters, the servers are monitored 24/7. In addition, each site receives a custom SSL certificate. This means enhanced data encryption and greater protection against hackers. In terms of server space, EKM doesn’t impose the same kinds of caps as similar platforms. Rather than restricting bandwidth and storage, the company imposes revenue caps. So a Startup customer will need to upgrade their account if they exceed $50k in revenue, a Growing customer will need to upgrade their account if they exceed $150k in revenue, and an Established customer will need to switch to an enterprise plan once they reach a 7-figure revenue. Bandwidth and storage are unlimited. The customer service team is friendly and knowledgeable, but support is tailored to users in the UK. For instance, all of the phone numbers are UK-based, and the company doesn’t currently offer a toll-free option. As a result, US-based callers may be subject to international charges when calling for assistance. The hours of operation are also UK-based, so US customers will need to reach the support team between 8am and 6pm GMT (the UK’s standard time zone). For a customer in California, that means getting in touch between 4pm and 2am Pacific time. Thankfully, the company does offer other means of contact. EKM provides live chat support during regular business hours, and it typically takes less than a minute for a customer service representative to respond. The support team can also be reached through email, and email responses are typically received within 24 hours. Finally, the EKM website has a Help Center that’s loaded with useful articles, tutorials, and FAQs. The majority of the guides are extremely detailed and easy to follow, addressing common issues that range from choosing themes to setting tax preferences. There are more than a dozen helpful videos on the site, and the user forum is a great place to get answers to questions that aren’t covered elsewhere in the Help Center. EKM offers all of the essential features that a user would find in any Ecommerce platform, but then it takes things a step further. 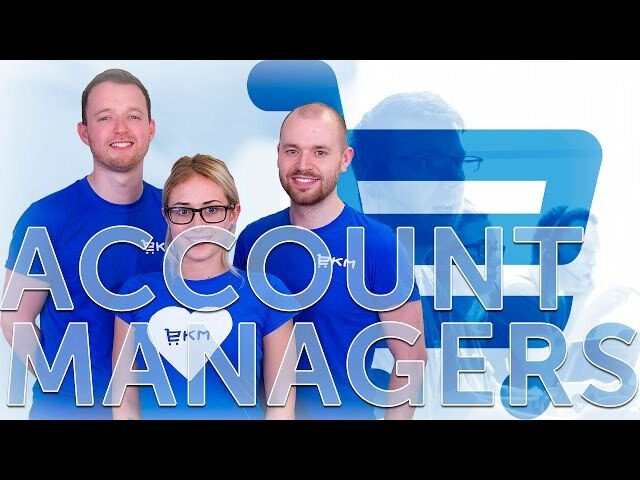 By providing users with a dedicated account manager and ongoing site reviews, EKM acts not only as a platform but as a partner. The company takes an interest in the success of each customer, regardless of their membership level. EKM has also streamlined many of the most frustrating aspects of setting up an Ecommerce store. For instance, by providing each user with an automatic SSL certificate and a default payment merchant, the company has made it possible for any store owner to get up and running in minutes without having to purchase and configure any third-party services. 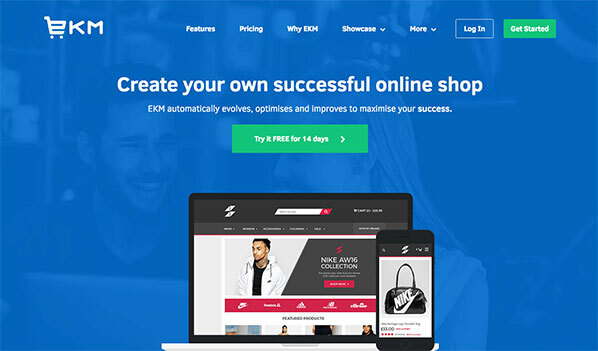 Though the customer support and SEO features could still use some fine-tuning, EKM has put together a truly impressive shopping cart solution at a competitive price.